K-pop is taking root in the pop culture scene in Brazil. This year’s iteration of an annual K-pop competition took place in downtown Sao Paulo on Friday evening. The event saw 71 teams from across Brazil take part in the preliminary rounds, with 16 teams, eleven dance and five vocal teams, making it through to the main competition. This year, the K-pop competition was held as an opening event for the 2018 World Pop Festival. 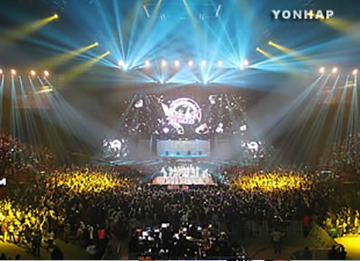 Musicians from around the world performed at the venue, with Korean idol bands such as Black6ix and DIP on the bill. The chairman of the Korean culture center in Brazil, which hosted the competition, said it was meaningful to hold the show in conjunction with a local music festival, adding that he plans to seek ways to further satisfy the demand for K-pop in the country.